Ginny let me out of the house asked me to go with her to the grocery store. Of course, I darted straight back to the meat department to find the goodies! Maybe it was the preparation for Thanksgiving, but there were a lot of turkey legs for sale. 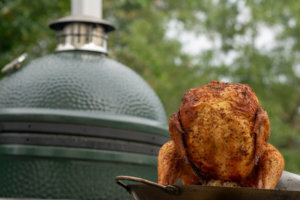 I have wanted to try a nice brine followed by a good grilling, and decided to try my hand and grilled turkey legs on the Big Green Egg. When I got home, I made a liquid brine with cool water, sea salt and sugar. I added the legs, put them in the fridge and waited. And waited. And waited. I left them in the brine for six hours, but in hindsight, I think I could have let them remain in the mix overnight. As it neared the end of the brining period, I started the grill. I used my Fogo charcoal and set up the grill for indirect heat by adding the plate setter. 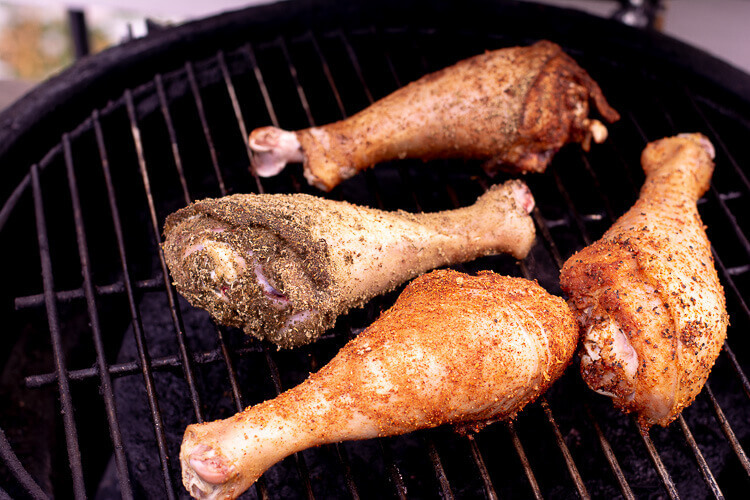 If you are using a gas grill, turn off the burners immediately under the turkey legs. It was time, and I removed the legs from the brine. Run each leg under cold water and make sure to lift the flaps of skin to give it a thorough rinse. I had four legs and I couldn’t decide on the seasoning to use. I decided to try four different ones. First, a plain and simple sage rub. I used a good handful, maybe three or four tablespoons, and rubbed the whole leg to evenly coat it in a generous amount of sage. For the second leg, I used Penzey’s Spices Northwoods mix. I love that spice mix. I even add it to my hard boiled eggs in the morning, so I thought it would be fun to try it on the leg. The third leg was coated in Dizzy Pig DizzyDust. This is one of my favorite all-purpose spice mixtures. You just can’t go wrong. It helps that I live fairly close to the Dizzy Pig store in Manassas, so it is always easy to replace it if need be. If not, try this link on amazon to order your own DizzyDust mix. The fourth leg was coated in my own homemade spice mix that I use on my beer can chicken. Another family favorite that I know is a home run in our house! Now, the fun begins! Make sure the grill is close to 350 degrees, and set the legs on the grate. Set the timer for 20 minutes and check the legs. I found that the grill had cooled a little, so I opened the top and bottom vents a bit more to bring the temperature back up. Start checking the internal temperature of the turkey legs after about 45 minutes. You want the internal temperature to reach 165 degrees fahrenheit in the thickest parts. 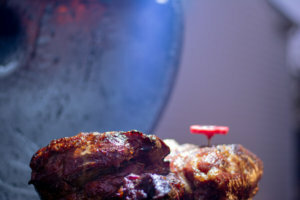 You can tell when it is getting close as the meat around the bone will start to contract a bit. These recipes were definitely easy, but did require some planning. The curing process is easy, but it makes a big difference. The legs were so darned juicy. Other than the length of time curing, this is one of the easiest recipes I have grilled. Rub on a seasoning and let it slowly grill on indirect heat and you have a delish dish! 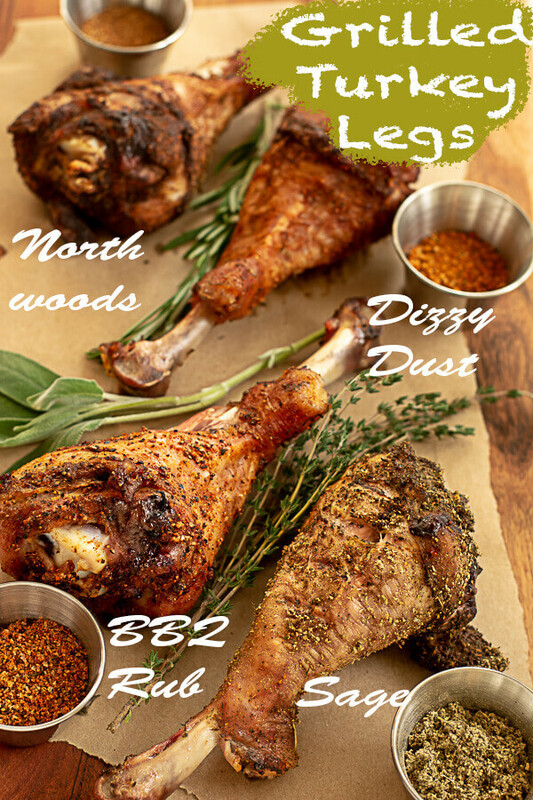 I tried four different rubs on the legs. My favorite was Dizzy Pig DizzyDust rub, but the plain sage was a close second. The other two were good, and I sure didn’t leave any leftovers, but the first two were my favorites. I read that some folks brushed a honey mixture over the legs and cooked the last 5 – 10 minutes on direct heat to create a glaze over the turkey legs. I considered that, but I thought the honey might overpower the herbs and spices. Maybe next time. 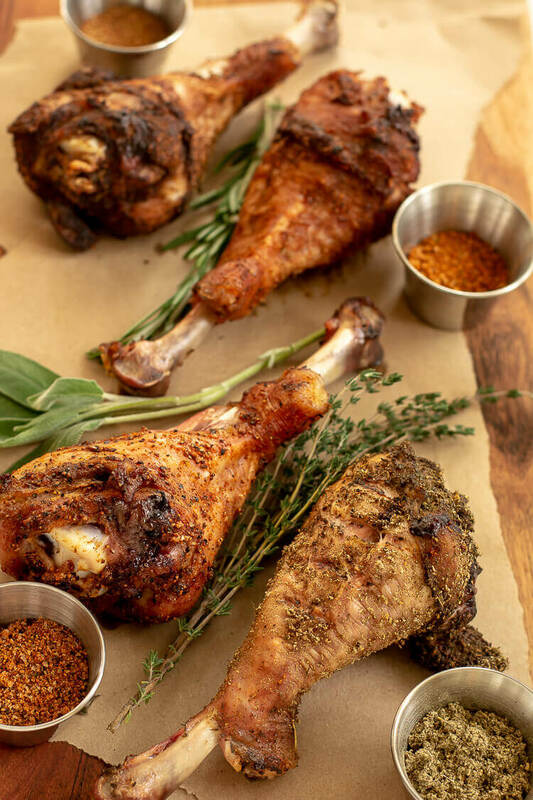 For looks, that nice glaze on a turkey leg will make for a nice presentation, but I probably won’t use a strongly flavored dry rub. 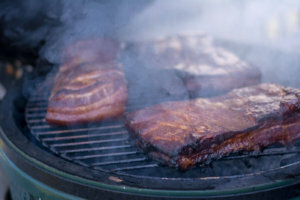 For the Dizzy Pig Dizzy Dust, a nice mellow BBQ sauce always works great over the top of those spices. If you like a little bit more kick, try a spicy sauce. Since these would be seriously incredible for friends coming to watch a game, preparing them for a tailgate or your favorite bowl game is on tap. Try out the Apricot BBQ sauce that we made for chicken thighs. This would be so easy to make and create an incredible, sticky sauce on top of the skin. How about the Honey and Orange Sriracha Sauce to add once they are almost finished? Just a bit of kick with the sweet and citrus mix! Sign me up! 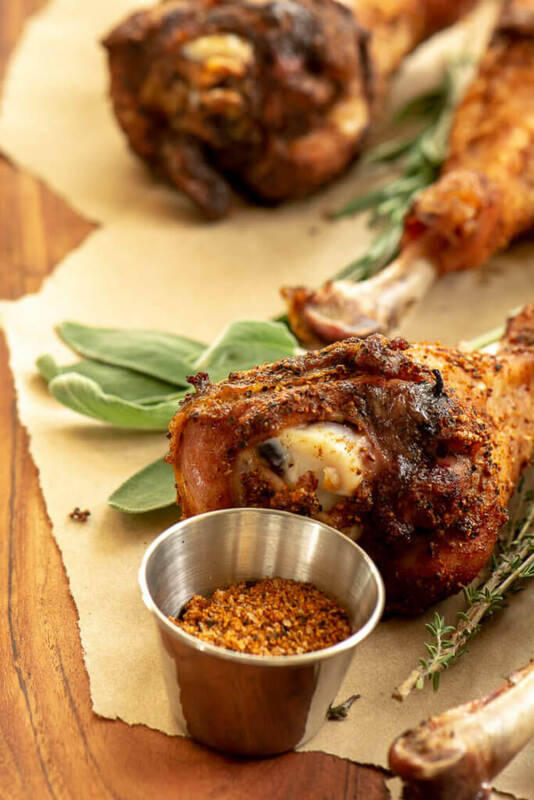 Cherry Turkey Legs – Can you almost taste them now? Use the Cherry Bourbon BBQ Sauce in our Cherry Chicken recipe. 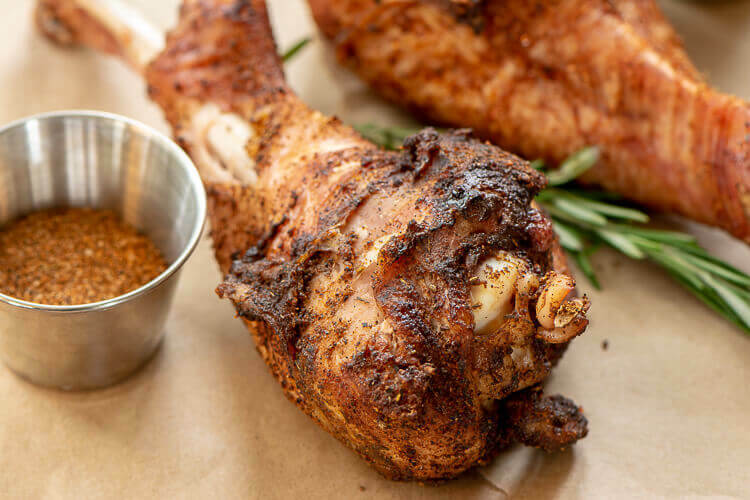 Grill the turkey legs as you normally would and apply the sauce the last few minutes, turning every minute or two. Apply multiple times to really get a thick, gooey glaze on there! Maybe you don’t love the Orange in the Honey and Orange Sriracha chicken so leave it out and make Honey Sriracha Turkey Thighs. If you need/want to go really easy here, try a jar of bbq sauce (we won’t tell!) and slather it on the last few minutes of the cooking! Again, I love to apply the sauce a couple times and keep turning to achieve that gooey and sticky skin we all love! Let us know how you cooked them and how did everyone like them? We love the feedback and can’t wait to see how you served them up! Combine the water, sea salt and brown sugar. Stir until it is dissolved. Add the turkey legs to the brine mixture. Weight them down if needed and place them in the refrigerator. The key is to make sure that they are fully submerged to accept the brining mix. I wanted to try different seasoning mixes, so I called for taking ¼ cup of each mix. That was plenty for each leg. Coat each leg with the seasoning of your choice. Make sure to apply liberally. Set the grill on direct heat and adjust the temperature to 350 degrees. 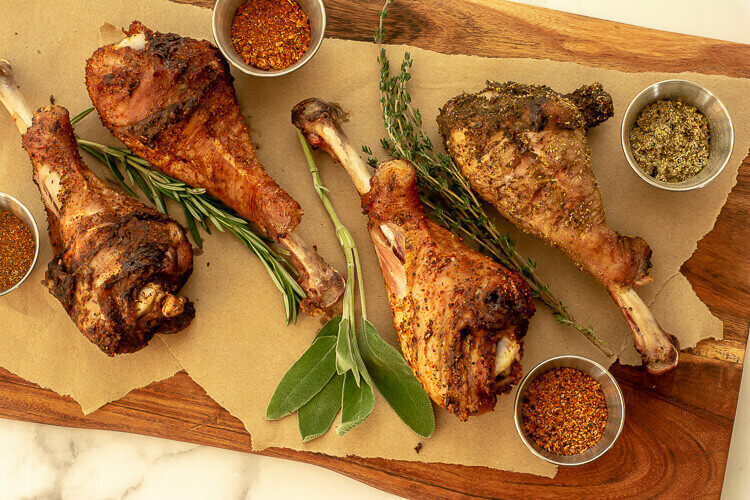 After 20 minutes, turn the turkey legs over and grill for another 20 minutes. Check them with a meat thermometer. They are ready to be removed when the thickest parts are over 165 degrees. Optional: I did not do this, but you can brush a honey glaze on the turkey legs during the last few minutes of the grill. This will create a nice glaze and add some sweetness.